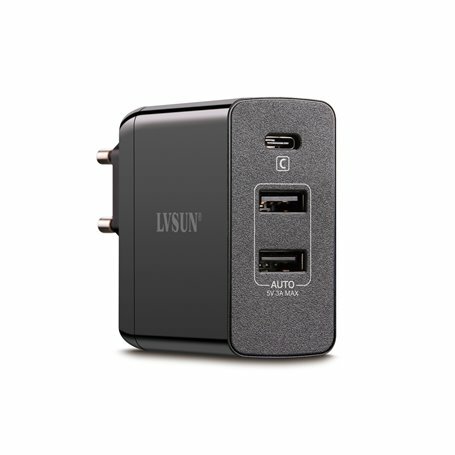 The USB Travel charger has a USB-C port with Power Delivery 2.0 and two USB ports. This powerful USB charger will allow you to charge all your devices (laptops, Ultrabooks, tablets, smartphones, etc. ..) on a simple power socket. The USB-C port is compatible with many devices like the Apple MacBook Pro 12, the Google Chrome Book or the Dell XPS. This microprocessor-controlled charger with intelligent security systems allows you to safely charge your devices, often faster than the original chargers from manufacturers. The wide input range of 100 - 240 V allows you to use this charger in other countries.